is a 501(c)(3) tax exempt charitable organization. It Is Epilepsy: The Challenges & Promises of Automated Seizure Control is a 56 minute documentary that chronicles the hidden disease of epilepsy, the patients and families who suffer with it, and the hope found in the latest research which uses math, engineering, physics and technology to predict/detect seizures and automatically control them. After almost ten years in the making, It Is Epilepsy was completed in mid-2009. Since then we have entered it in film festivals in the United States and around the world. The response has been wonderful. Click here to see the list of awards, screenings and other recognition It Is Epilepsy has received. Our ultimate goal is for It Is Epilepsy to be aired on television so that the public will become more aware of epilepsy, and those who suffer with epilepsy in their lives will find hope in the promises of research. It Is Epilepsy will be available for purchase at a future date. 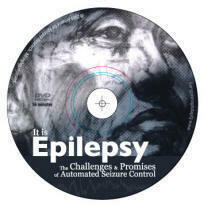 It Is Epilepsy: The Challenges & Promises of Automated Seizure Control provides an overall look at epilepsy and the impact it can have on the lives of those who suffer with seizures and on their families. Then, It Is Epilepsy features the promise and hope found in the latest research on predicting and automatically controlling (and even preventing) seizures. Even though we live in the twenty-first century, epilepsy remains a stigmatized and hidden disease. 3 million people in the United States and 60 million people worldwide suffer with epilepsy. More Americans have epilepsy than have Muscular Dystrophy, AIDS, HIV, Multiple Sclerosis and Parkinson�s disease combined. In one poll of U. S. patients it was reported that approximately 80% of them continue to have seizures or problems with side effects from medications or both. These complications result in disability and dependence on family members and society. Additionally, as many as 40,000 people DIE annually as a direct consequence of seizures. More die and are injured in accidents caused by seizures. The direct and indirect financial costs of epilepsy in the U. S. are conservatively estimated to total $12.5 billion annually. This is a startling set of facts unknown to most Americans. In It Is Epilepsy patient and family stories show the despair and frustrations suffered by millions of people who live daily with this disease. A classical music metaphor is used to help explain and demonstrate what happens in the multi-tasking brain as a seizure takes over. Clinicians describe the different types of epilepsy and current treatments. But it is the unpredictability of seizures that can be the most crippling, and can most negatively impact safety, life span and quality of life for epilepsy sufferers. To address this issue an extraordinary, multi-disciplinary team of scientists � neurologists, mathematicians, engineers, computer scientists, physicists and neurosurgeons � have developed a system that predicts seizures before they occur. In addition, the team is currently developing a method of preventing seizures from even taking place. The progress of this research will provide hope to the millions of people who suffer with or are affected by epilepsy. Lack of public awareness of epilepsy is one of the biggest roadblocks in efforts to expedite research which will ultimately improve quality of life for all who are affected by this disorder. It Is Epilepsy tells this important story to the public and helps shed light on epilepsy, the hidden disease.